Robert is the Vice President of Programs at the Evelyn and Walter Haas, Jr. Fund, where he oversees grantmaking and program strategy. Before joining the Haas Jr. Fund, Robert worked as a senior program officer at Tipping Point Community and a program officer at the S.D. Bechtel, Jr. Foundation. Robert is an attorney by training, and spent his early career at private firms and briefly in criminal defense. 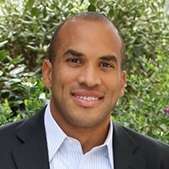 He earned his Bachelor of Arts degree in Political Science and English from Emory University, and he holds a Juris Doctor from Duke University School of Law.